Last week Kuwait tied the world’s highest known temperature at 129.2 degrees (54 Celsius). Temperatures soared around three degrees more than the forecast 46°C, 120F, on Wednesday, meteorology sources in Sharjah airport said. With the soaring heat and humidity as less as 0 per cent at times, the weather condition was miserable for people outdoors as dusty-carrying winds added fuel to the fire. Later humidity was recorded at 49.2 per cent and normal, providing some solace from the burning sensation. The National Centre for Meteorology and Seismology (NCMS) also forecast on Wednesday as dusty with poor visibility, windy and hot with chances of some rains in the mountain areas. It had predicted that the month of August, in terms of high temperatures, is an extension of July and may hit by hotter winds and dust from the Empty Quarter (Rub Al Khali). Hot southerly to south-easterly wind coming from the Empty Quarter will cause substantial rise in temperatures in all parts of the UAE. When wind accelerates, it causes rising dust. The historical data records show that the highest maximum air temperatures had been recorded at 50.2°C at Swiehan, Abu Dhabi, in 2012, while the lowest air temperatures was recorded at 16.1°C at Jabal Mabreh, a mountainous area in the north, in 2013. In the open outdoors, temperatures crossed 50°C, and taxi drivers and working class people reported quoting mobile phone and taxi metre measurements of temperatures. The outside temperature measurements using mobile phones and taximeters or any other gadgets,are not reliable and should not be followed, Chairman of Adco Astronomy Club and Member of Abu Dhabi Heritage Group Mohamed Talib Al Salami, a meteorology expert said. "The temperatures are strictly measured using specific parameters. We should not rely on measurements taken using mobile phones and car metres. There are official instructions to people not to rely on such measurements," he said. Temperatures are usually measured by metres kept in boxes kept in shaded, grassy areas, more than one metre above from ground level. It will be different from temperatures taken from open grounds and deserted areas, he explained. The Sharjah Meteorological office source also agreed that the outside temperature might have gone up beyond 50°C as claimed by taxi drivers who were going around Sharjah. "Under direct sunlight and other situations like engine heat, air-conditioning outlets and thickly populated areas, temperatures may cross the official version," the source said. Visibility was also poor in the early hours of Wednesday, which was later cleared by winds. Visibility was 7km around 2pm on Wednesday. Localised summer rainfall is also expected in mountain areas in Al Ain and Omani border areas due to tropical situation. 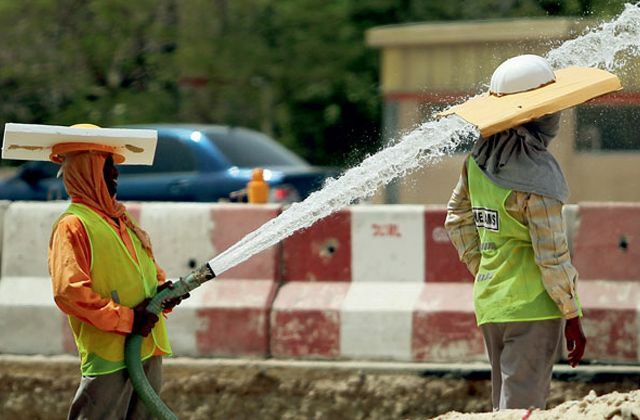 Kuwait tie's the world’s highest known temperature this week at 129.2 degrees (54 Celsius). Firm goods need to be preserved at a permanent temperature. If the weather is gonna be wet or cold, it's not a wise decision to keep crops out of stock or hut. Paddy, jute, corn should be preserved in room temperature and in a place where it can get enough space to spread. Weather Measuring Instruments has a vital role in this.